30 Days of Paganism: Why Paganism? TL;DR – I had no choice but to be pagan. Identifying as Pagan has been a bit of a struggle for me, and it is very much a label I adopted after the fact. I was raised in a mostly secular household, in the middle of the Bible Belt. I attended Vacation Bible School, but not much else in the way of churches. Whenever I asked my mother growing up what religion I was, I was told to tell anyone asking that I was Methodist. I had no earthly idea what that meant, but I used it. Despite growing up where I did, I was exposed to a lot of different religions, from a very young age. My friends were Catholic, Protestant, Jewish, Muslim, Hindu, and Taoist. I occasionally went to church with my friends, but I also went to Synagogue or attended Shabbat at my friend’s house, or watched their parents light incense in front of family member’s photographs. I never thought much of them, or what it really meant to be a believer, or about how I did not really have a religion. I began developing my own beliefs, reincarnation being the first and biggest. Beliefs in different kinds of entities, such as angels, followed. Possibly even God. And, then, the floor fell out from beneath my feet as I plummeted into what would become severe anxiety and depression issues. I went through a phase of a few years where I was a nihilist. I eventually clung to existentialism like a very leaky life preserver, all the while amassing a nice collection of strange experiences that made me feel like I was going crazy. Dreams and visions of angels speaking to me, telling me things. Past life memories seeping through into the cracks of my fragile psyche. Experiences of leaving my body, and of falling further into myself during meditation. Later, I learned words for these types of things. But at the time, I thought I was the only one in the world going crazy in this particular way. I then enrolled in a private religious university due to its proximity and status to my home. As part of the core curriculum, all students had to either take a course on the Bible, or a course on world religions. I took the latter. The next semester, I enrolled for two more religious studies courses. The next semester, four. I was hooked. I took classes on Christianity and Judaism; on Hinduism and New Religious Movements. I studied on my own, delving into NRMs (New Religious Movements), and on mysticism. I finally had a vocabulary for my experiences, and while I was virtually always the only non-Christian in my classes and did not fully belong, I found a dialogue I loved to be a part of. Four years later, I had earned a (practically useless) degree in the subject. Those years were years of exploration. I constantly felt lost. I did not have my own beliefs, or opinions. I could understand all the different religions and their views, and was lovingly nicknamed “the anomaly” and “the weird one” by my professors, who loved that I always brought a completely different perspective to coursework, as well as being very adept at the role of devil’s advocate. What they did not know is that I could do this, because I was drowning in a sea of deep aching for some semblance of solid ground. One single belief I could actually own and cling to, like it seemed all of my other classmates had. It was not until after I graduated, that things started to solidify. And they did not solidify due to research, but due to my own personal experiences kicking into overdrive. My dreams got clearer. Visions became downright hallucinations at points. I could visit other worlds when I laid down and closed my eyes, interacting with angels, and, eventually, deities. Deities were major do-not-want territory. I had adamantly denied the possibility of polytheism to myself for most of my life. That should have been my sign right there. I have a running record of seriously not wanting things that I wind up being intricately tangled into. So, here I was, a lost soul clinging desperately to the idea that nothing could possibly actually exist, while I was being barraged with so much evidence to the contrary most people would have been crushed by it. I had read several stories in school about people having a single mystical experience over the course of their entire lifetime and it forever changing them, and here I was trying not to have yet another encounter with an angel or a god or something more nebulous, for the fifth time this week. Eventually, I gave in. It still was not until a couple of years ago I begrudgingly started referring to myself as pagan, since it was really the only umbrella term out there that remotely applied to me. And it was not until within this past year, I started to feel like I could actually be a part of this community, and actually started owning the label with some strange kind of pride. Oddly enough, what allowed this to happen was taking another religious studies course, after four years without them, specifically on the history of witchcraft. The irony was, in my partner’s and my discussion group, we were the only two people who admitted to being pagan – and were often informing the conversation in a way that surprised me just how much about this community I know. For the first time, I was the one on the inside, looking out and trying to figure out how to let other people catch a glimpse in. That was the final turning point for me, being called out in that class. Yes, I could have denied being pagan. But forsaking the term would not change the fact that I interact with multiple deities; that I research and learn about my pantheon; that I have an altar set up; that I engage in divination; that I have actually come to believe. And I cannot shut any of that off and try to deny it, without going crazy. I did not have a choice to be pagan. To be honest, I do not really understand people who decided to become a member of this myriad of religions without being forced into it by divine experiences. I suppose to borrow a term used in an adjoining pantheon and community, the answer to Why Paganism? can be summed up in one word: Wyrd. This entry was posted in Uncategorized and tagged 30 Days of Paganism, Backstory. Bookmark the permalink. 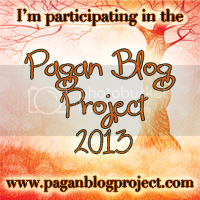 4 Responses to 30 Days of Paganism: Why Paganism? Neither do I (or at least by very strong spiritual experiences of some sort, whether divine or with other entities like land spirits, etc). That element of choice I think is what separates me from others, at its core. This entire path was laid out for me before I was ever born. And wyrd is a good word. It is relevant because the things you related to are traits I usually see people in this little circle having. Yes, it was a pretty textbook case. Unfortunately it was not until I had mostly gone through it, that I had heard that phrase and found resources related to it. I really like that quote you gave – it is so true!